Storytelling is the concept du jour in content marketing. Make sure you have a hero, and a journey, and a harrowing tale, and a surprise twist. It’s not bad advice. Infusing your content with a story makes it emotionally resonant, creating memorability and impact it might otherwise lack. So, I’m absolutely on board with storytelling as a content marketing device. But just because you understand story arcs and can riff on Joseph Campbell doesn’t mean you’re now Francis Ford Coppola or William Faulkner. 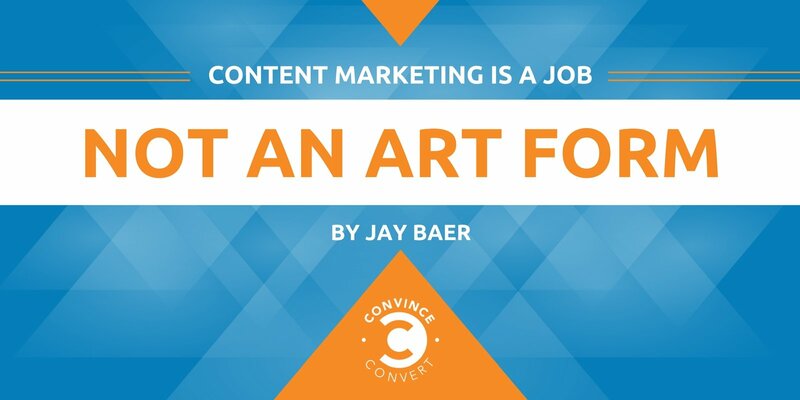 Content marketing is a job, not an art form. You’re not competing for accolades and critics praise. You’re competing for consumer attention, period. The only job that content marketing has is to create behaviors among target audiences that benefit the business. There are, of course, a lot of ways to do so. Youtility content. Content that makes you laugh. Content that makes you cry. Content that makes you mad. But ultimately, content must prod behavior, or it’s a useless exercise. 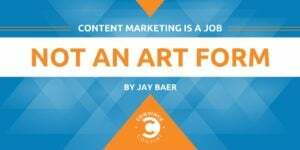 I see more and more content marketers straying from this perspective, thinking that they are newfangled hybrid players, straddling the line between fine art and commerce. They are not. I am not. You are not. We are using information and entertainment to sell stuff—perhaps elliptically, but the end game is the same. So being precious about your content creation processes and approaches does nothing but fog up your windshield. And he’s talking about songwriting, which many people would actually call an art form. Content marketing is not. It’s a job. Not everyone can do it. And it’s not dishonorable to have this occupation. You don’t need to disguise yourself in the cloak of the “artist” to make yourself feel better about what you’re trying to accomplish with every blog post, podcast, infographic, and YouTube video. Figure out who your relevant audiences are. Determine what information they need from you. Give it to them, in multiple formats. Throw in an interesting wrinkle now and again, maybe by using storytelling techniques. Test and optimize. Repeat. Don’t make content marketing harder than it already is by thinking it’s something that it’s not. It’s a job; embrace it.